A new poll says that during the last 90 days, as many consumers have decided they want Google’s Android phone as want Apple’s iPhone. And this trend may just be an appetizer. DailyTech reported that research company ChangeWave conducted a pair of surveys, one in June 2010 and the other last month in September, and compared the results. 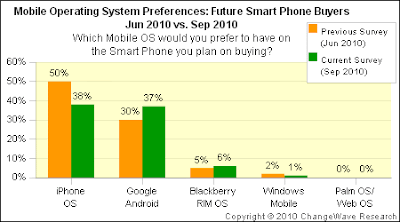 In the June survey, 50 percent of people who said they were in the market for a smartphone said they preferred an iPhone, with 30 percent opting for Android. Just three months later – a period which included the June 24 launch of the iPhone 4 – Apple’s serious lead was seriously diminished. The September survey has only 38 percent of consumers looking to iPhone, a substantial 12-percentage-point drop. 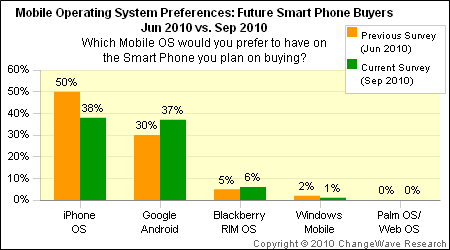 Meanwhile, Google (GOOG) has surged up seven points and now is nearly tied with the iPhone at 37 percent.